Flying Furballs, a hilarious action-packed adventure series, captures the romance and excitement of the era at the dawn of aviation - set in a world of cats versus dogs. Put simply, Flying Furballs is pussycats, planes and Paris. Our hero is Claude D'Bonair, a young pilot in the cat air corp, keen to prove his worth to the older pilots and live up to the memory of his father. Will cats and dogs ever live in harmony again? Will Claude survive with his nine lives intact? 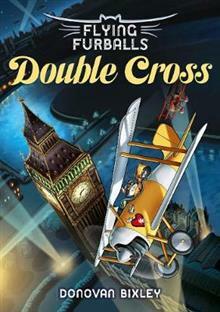 In Double Cross Claude and Syd are on leave in London when they are called on for one of their most dangerous missions yet. Who is the traitor that is working against CATS? Donovan Bixley is an illustrator and writer based in Taupo. Donovan has numerous bestsellers to his name, including the recent Much Ado About Shakespeare. Donovan created Pussycat, Pussycat (2015), Little Bo Peep (2014), The Wheels on the Bus (2010) and Old Macdonald's Farm (2011).